"You can't kill me! I'm Jesus Christ!!" I first saw the awkwardly titled Thou Shalt Not Kill...Except when it first hit the home video circuit. The buzz around it was the fact that director Sam Raimi (Evil Dead, Crimewave) had a starring role and it was written and directed by Evil Dead collaborators Bruce Campbell and Josh Becker. At the time, the film was one of the most bizarre, low budget productions I had ever seen. It was sickly humorous and satirical, but also managed to be pretty entertaining for a sort of hybrid action/horror movie. The film opens in a non-descript section of the Vietnam war, circa 1969. Sgt. 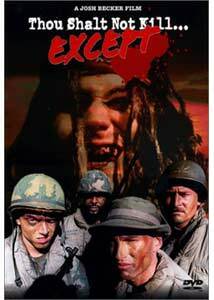 Jack Stryker (Brian Schulz) and his platoon are faced with pretty grim odds when a clueless Lieutenant, David Miller (John Manfredi), decides to lead them all in a suicidal charge against a Viet Cong-controlled village. Stryker's leg gets injured in the battle, but the platoon manages to kill the enemy in droves and save the day, so to speak. Stryker gets to go back home to America, finding home a place that isn't too familiar to him. He tries settling back into his normal routine, but finds it difficult. Meanwhile, a group of weird cultists are making a name for themselves by slaughtering dozens of innocent people, as led by Sam Raimi. Stryker attempts to rekindle an old relationship with his former girlfriend, but suddenly finds that she's been kidnapped by this same cult he's heard about on the news. His war veteran friends visit him on leave and they all decide to join up on a vigilante mission to destroy the evil cult and save Stryker's girlfriend. Director Josh Becker makes no pretensions about the film: it is indeed meant to be about a group of typical Vietnam vets coming home and fighting Charles Manson. True, the cult is unnamed, as are its members and leader, but it's basically the Manson family. There's even a great scene of the cult "tripping out" to a faked version of The Beatles' Revolution 9 (a reference to Manson's obsession with the White Album) This probably sounds funny to most, and it certainly is. Becker slyly makes the movie extremely humorous by throwing in purposefully melodramatic, typically "war movie" style dialogue. Stryker's character is sort of a hybrid John Wayne/Gary Cooper character and it really makes fun of the typical vigilante justice film. When Stryker returns home, many things are thrust at the viewer to insure we realize this is the late 1960's (including stock footage of a generic, small town and hilarious, forced references to late 1960's events). It's all very tongue-in-cheek, but at the same time it's expertly handled. For such a drastically low budget film, most likely to induce unintentional laughs, the material is crafted better than you might expect. It's all very odd, but then that's the point. The problem with the movie is that it's so unusual and fairly amateurish that I'm sure most people probably never gave it a chance. Though it managed to garner some decent reviews upon release, the film has faded into cult film obscurity. That's actually the most comfortable place for it, I'll admit, but ironically if this had been a student film it would have been praised as a great start to a young director's career. As a theatrical release, however, it was mainly panned. Well, movies are centrally about being entertaining, at least in my opinion. High art is great, but if nothing else, Thou Shalt Not Kill...Except is definitely entertaining. Of course, it's going to be more entertaining to fans of the whole Evil Dead crowd. Not only is Josh Becker's style cut from the same cloth, but the film used many of the alumni in that group, who not only went on to future film projects with Becker and Raimi, but also worked on the Raimi-concieved TV shows Hercules and Xena. The impressive (and costly) orchestral music score was by Joseph DeLuca, who scored the Dead films among other things. Overall, this is a pretty choice example of fun filmmaking. Image Transfer Review: The disc preserves the 1:66:1 cropping of the original frame (meaning only very, very small black matting) which is a nice touch. Visually, the film is a mixed bag. The film wasn't made with superb film stock to begin with, and now with some age on it, it looks pretty rough. The transfer here is excellent, totally free of artifacts and other digital flaws, but the source print is fairly grainy. Some scenes are VERY grainy and spotty. No one can be blamed here, it's obvious that Anchor Bay did the best they could with the core material, but it still needs to be understood that this is far from reference quality. Audio Transfer Review: The mono soundtrack is about what you'd expect. Even though most of the audio is production quality (on set) it's pretty good and fairly vibrant. Some dialogue is a little harsh, but again, it's about equal to the quality of the video. 1 Feature/Episode commentary by Josh Becker and Bruce Campbell. The deleted scene is merely an extension of a fight sequence already in the movie. It's only a few seconds long and I have to wonder why it was cut (Becker does not discuss why in the commentary). In any case, the quality is definitely lower than the movie itself. The film was originally to be titled "Stryker's War" before the distributor renamed it. The original title sequence is included here. The laughable trailer for the film is here, as well as the keepcase insert which contains the essay "The Making of Thou Shalt Not Kill...Except" as written by Josh Becker. Having long been a cult film, this DVD edition gives a nice treatment to this often forgotten work. Anchor Bay scores points again with their devotion to these works. Recommended.